For a number of reasons, you might choose to have a small keepsake urn. They’re beautifully crafted, personal, and very discreet. They come in a vast array of styles, colors, designs, and materials which we will discuss. Below we’ll list our favorite keepsake urns on the market. We’ve chosen these options based on their design, workmanship, quality, and value for money. We hope it makes your decision easier in this difficult time. 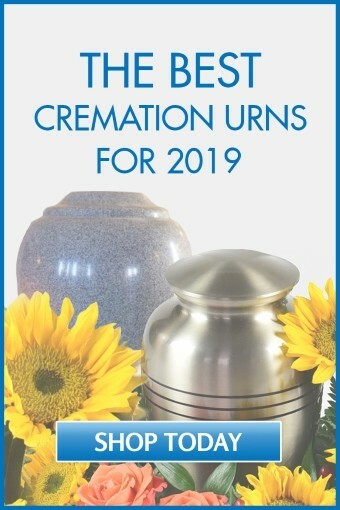 Unlike traditional urns which hold the cremains of an entire person, these urns will hold just a small portion of ashes. 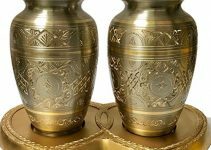 There are a number of situations in which you might consider using a keepsake urn instead of, or in addition to, a larger, traditional cremation urn. If burial has been chosen, you may want to keep a small portion of ashes close to you. A keepsake urn may also be used to hold other items and mementoes, such as hair or jewelry. 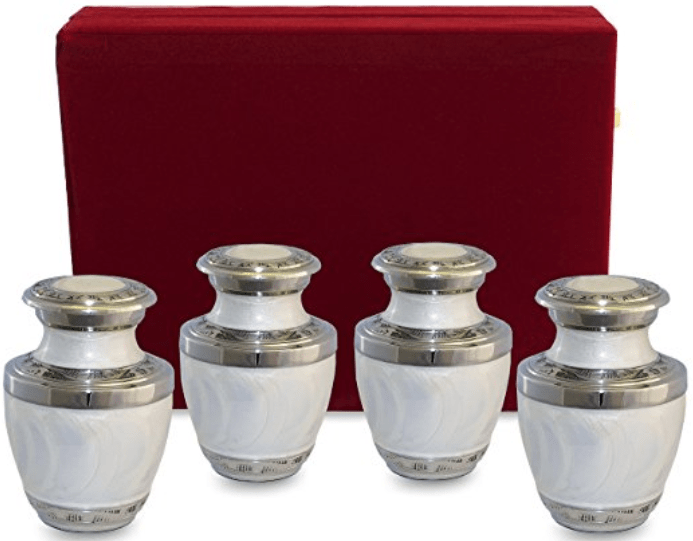 A set of keepsake urns may be used in addition to a larger urn so that small portions of ashes can be shared among different family members. If ashes have been scattered, a portion of the ashes can be kept in keepsake urns to give a comforting sense of permanence, even if people move away from the location. 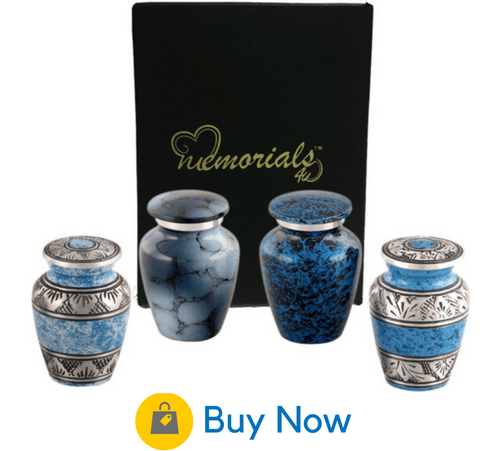 Keepsake urns come in a variety of colors and styles. 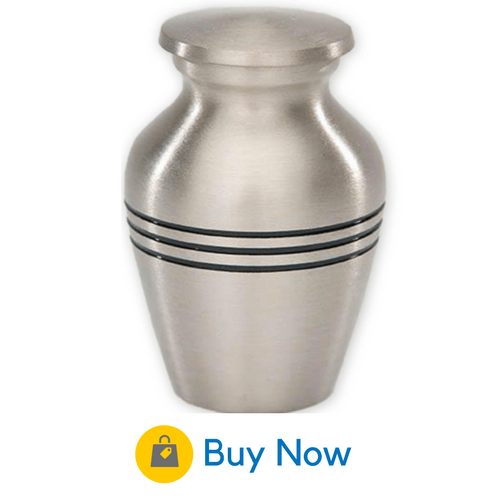 You can easily choose a keepsake urn that reflects the unique spirit of your loved one. This is a set of four tiny brass urns in a deep shade of blue. 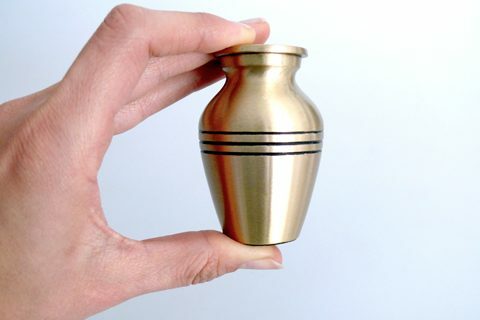 Each urn can easily fit in the palm of your hand. The urns are enamelled and hand crafted with individual designs, so that no two are alike. Even within the set, each urn is different, representing the unique relationship that each family member enjoyed with the departed. A similar set of four tiny brass urns, these come in ethereal white. They are nickel-plated and finished with mother of pearl, making the urns appear delicate. Though appearing delicate, they are in reality very solid and durable. An elegant velvet case is included in the package of urns, giving you a convenient but luxurious way to store the urns until you give them to family and friends. These handcrafted metal urns, also in sets of four, have a smooth, shiny, lacquer coat. The design of each urn is unique. Silver engraving combined with varying shades and swirls of deep blue, give them a look of beauty and elegance. 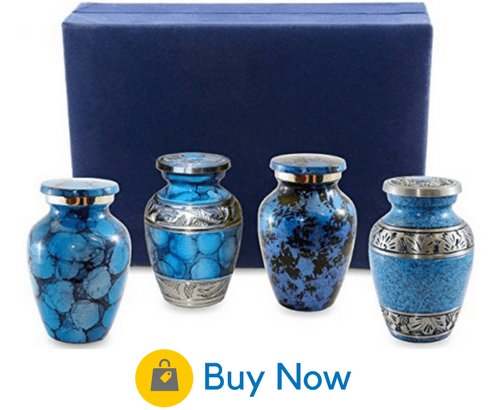 As each comes in a different design, family members can choose an urn that best matches the decor of the room in which they plan to display it. 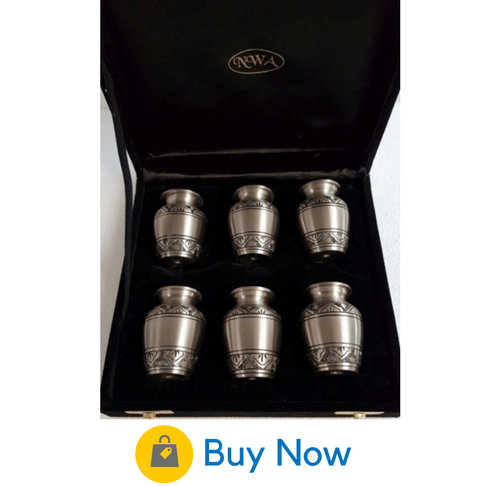 This is a set of six solid brass urns which come together in a black velvet case. A tasteful, engraved design, and a pewter finish give these a classy and traditional look. They are heavy-duty and durable. They are smaller than other mini-urns, and will hold just a tiny portion of ashes. They’re a great choice for larger families who want to keep a cherished member close to them. 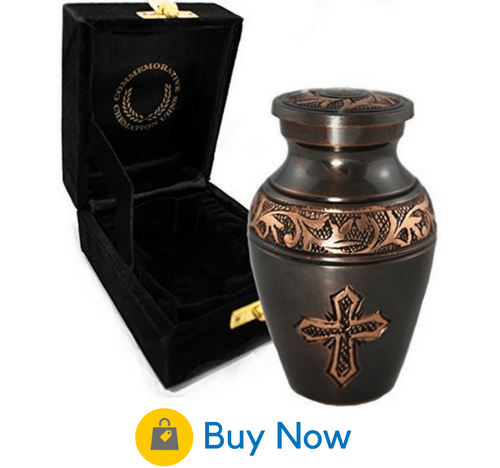 These urns are ideal if you wish to save a small portion of ashes that have been interred or scattered. An antique cross design hand-engraved on this brass urn gives it a look reminiscent of a historic church. A brushed bronze finish adds to the effect. 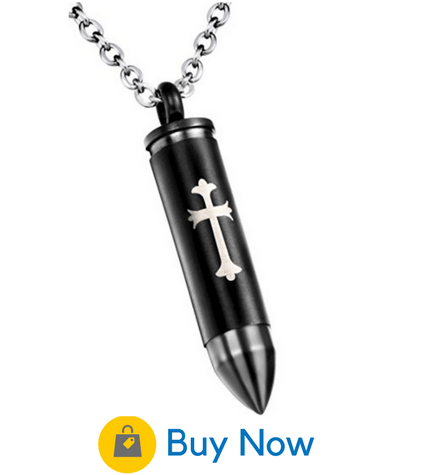 This is an ideal way to commemorate your loved one’s bold religious faith with style and simplicity. Because it’s made of 100% brass, it won’t rust or tarnish over the years. 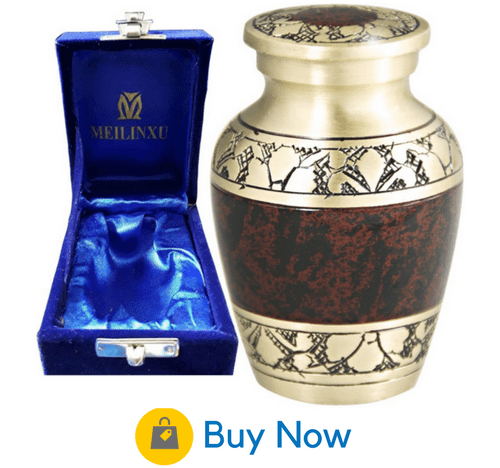 An earthy design in brown with gold-flowered engraving will bring peace to your heart when you look at this tiny urn. Besides ashes, this mini-urn may also be used to keep a lock of hair or to hold the remains of a small pet. 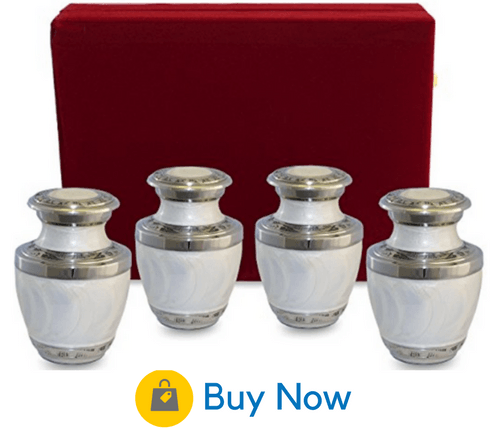 It is also possible to buy a matching full-sized urn, so that you can find comfort in knowing that your smaller keepsake is a miniature of the larger one. This is a handmade aluminum urn crafted by Indian artisans. A design of marbled oak gives it a comforting wood grain look. It is subtle and traditional enough to complement any home decor. This small urn looks especially nice next to a framed photograph or in an office space. This is a metal urn which is just as sturdy as it is beautiful. It’s a perfect choice to display in busy homes as you won’t have to worry about breakage by small children or active pets. A brushed silver finish and a minimalist design of three simple black lines complete a look of simple elegance. 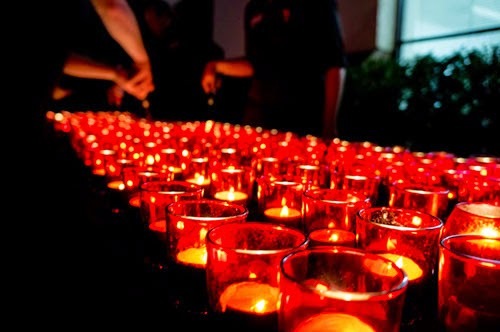 Lighting a candle is a profoundly meaningful way to acknowledge the light that your loved one holds within your heart. The warm light of a candle has an effect of deep comfort and helps you feel in tune with the eternal. And it’s even more meaningful when combined with a beautiful urn that keeps your loved ones remains nearby. To memorialize a feminine soul as beautiful as a garden flower, this urn is perfect. 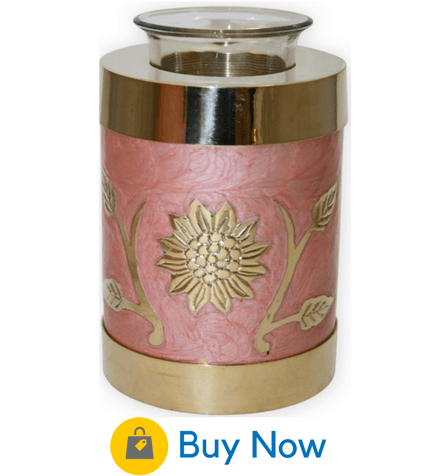 It’s made of brass with a delicate design of gold flowers on a background of shell pink enamel. Despite its ethereal appearance, it is weighty and durable, designed to stand up to years of use. 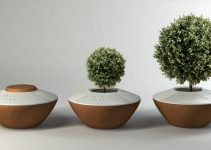 It’s larger than other mini-urns and can be beautifully displayed anywhere. 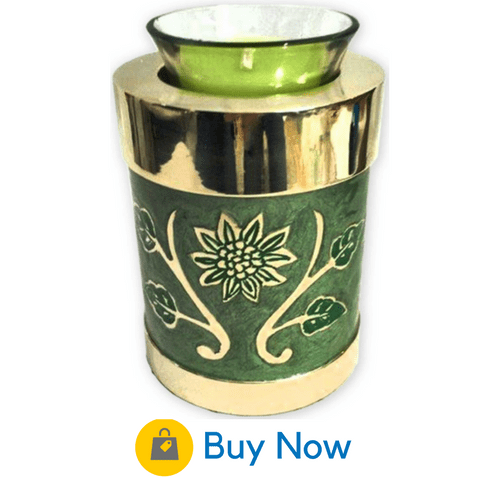 This is a decorative brass urn, features a design of green and gold flowers on a background of dark, earthy green. The urn is heavy and sturdy, in spite of its delicate design. 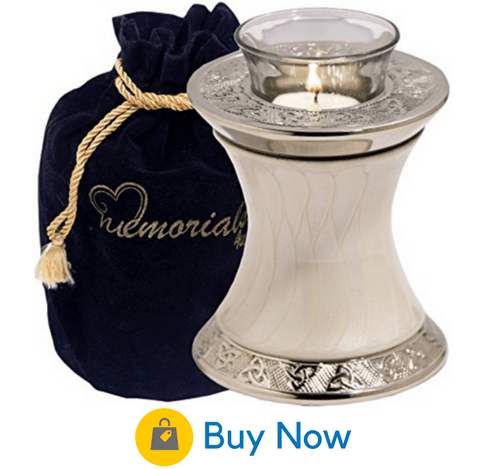 It’s an ideal choice for a loved one who adored flowers or gardening and who was a beacon of light to others. 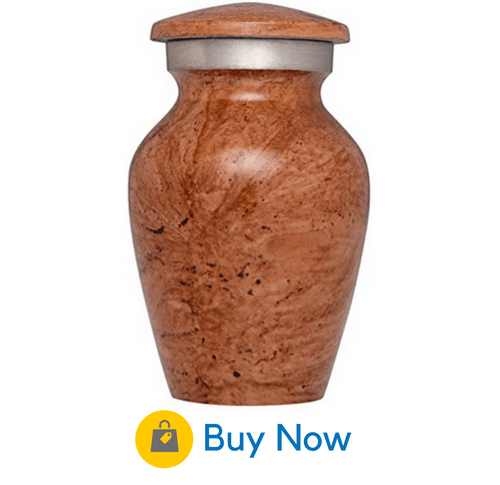 Larger than other keepsake urns featured here, this tealight urn can fit remains of up to 20 pounds pre-cremation. Crafted in elegant brass with a smooth pearl white finish, this ethereal tea light will more than do justice to the life of your loved one. It’s also very discreet, as you can display it in your home as if it were simply a beautiful tea light holder. Keeping a small portion of ashes in a pendant, ring, or bracelet keeps him or her close to you in a real and intimate way. You can look at or touch it as a reminder of your cherished friend or family member every day. Jewelry can be crafted with personalization or meaningful quotes to make it even more special. It can be simple or ornate, in almost any size, style, or color. 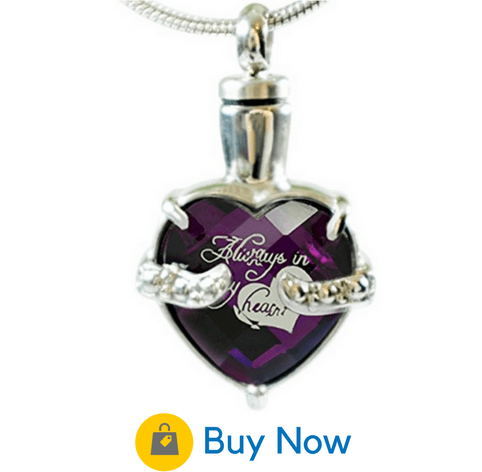 An inspirational quote (“Always in my heart”) is laser engraved on the inside of this purple glass heart pendant. Presently, Infinity Keepsakes are offering a promotion which allows family members to purchase five pendants and get one for free. 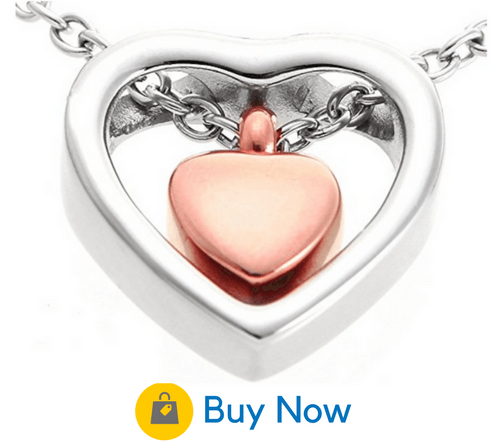 This necklace features a stainless steel heart-shaped pendant enclosing a rose gold heart within it. The pendant and chain are guaranteed to never rust or corrode. 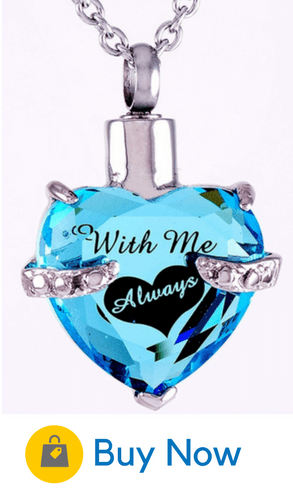 It is a wonderfully sweet and simple way to wear your loved one close to your heart all day long. 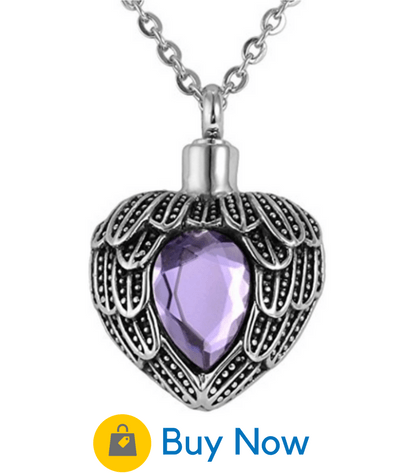 You can put ashes inside it, or you can use it to hold a lock of hair or soil from a special place. A pendant of delicate blue rhinestone can be worn every day on a 20-inch cross chain necklace. The words “With Me Always” are laser engraved inside the stone. The piece is tiny, and great care must be taken to fill it using the funnel kit provided. Wearing cremains in a piece of tasteful jewelry is no longer a comfort reserved only for women. This cylinder-shaped stainless steel pendant is both masculine and meaningful. The pendant is black with a silver cross boldly etched on it. 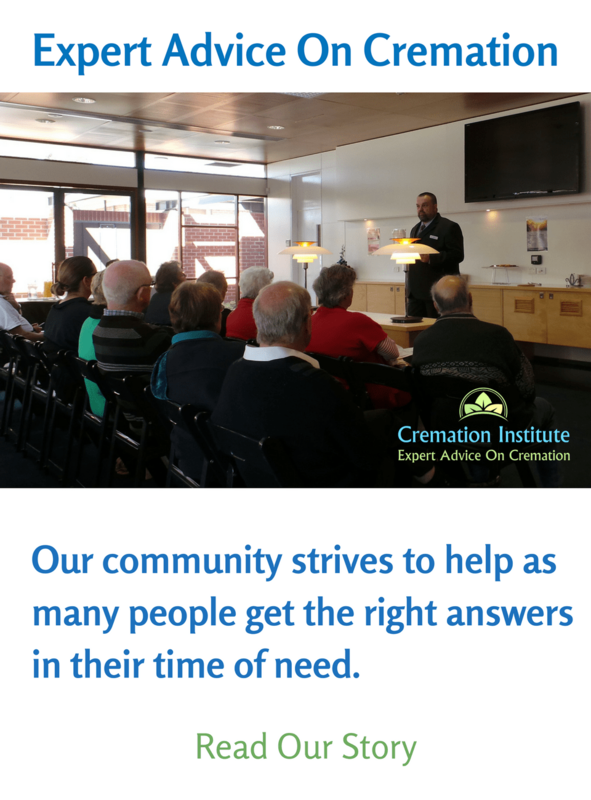 It’s a great way to share cremains among male members of the family. A stainless steel heart made of delicate angels’ wings frames a birthstone jewel to memorialize your loved one and hold their remains close. You can choose from 14 different colors for customization. The pendant is waterproof and designed to stand up to years of wear and tear.